Blue Hills Berries & Cherries is now open for picking. Please see the fruit report to see what fruit is available! IMPORTANT MESSAGE: Now closed Mondays. April 2019 opening hours: Tues – Fri 10am – 4pm. Saturday & Sunday 9am – 5pm. Egg hunt in the strawberry patch Sat 20th April! Free entry for kids – 9 am start until the eggs run out! Please note: Fruit availability can vary daily due to the weather & fruit maturity. Please see our ‘Fruit Report’ the night before you visit to ensure ‘U-Pick’ is available. Please follow our Facebook page for all of the latest news and upcoming events. Welcome to Blue Hills Berries & Cherries! We are a family owned and operated business located in Silvan, Victoria. We offer our visitors a unique ‘Pick Your Own’ Fruit experience at two locations – 30 Chapman Rd, Silvan for Cherries and 27 Parker Rd, Silvan for Seasonal Berries! At Blue Hills you can experience for yourself the fun, romance and satisfaction of harvesting your own sweet, ripe berries and cherries seasonally or purchase fresh picked from the farm gate. Picking berries is so much fun for the whole family. Bring the family and enjoy picking fresh berries and cherries in the morning and then relax with a BBQ at the nearby Silvan Reservoir. It is a good idea to wear appropriate footwear for the orchard. Please be sun safe and bring along a good hat and sunscreen as you will be out in the elements weather depending! If you would prefer us to pick your fruit for you, you can place an order during season times via email or phone 9737 9400 with details of your requirements and pick up times. Join the Blue Hills Berries & Cherries mailing list! We send out a couple of newsletters throughout the picking season to tell you all about Berry and Cherry availability, news upcoming events! Join via email today! Our berries and cherries vary in price so please see the pages above for further details. One of the great things about visiting us is you get to taste test berries and cherries while you wander the orchards! We offer our visitors a unique ‘Pick Your Own’ Fruit experience at two locations – 30 Chapman Rd, Silvan for Cherries and 27 Parker Rd, Silvan for Seasonal Berries! Call ahead if you are unsure of fruit availability. 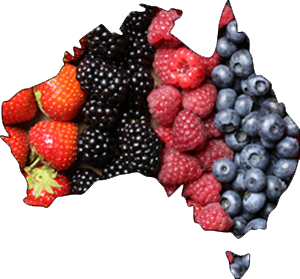 Blue Hills Berries and Cherries is an Australian owned and operated company. The Chapman family have farmed in Silvan since 1894 and are best known for their quality fresh & frozen fruit and provision of “Pick Your Own” or “U-Pick” berries.